We always enjoy visiting Inks Lake State Park. With 1201 acres and over 7 miles of hiking trails it's much more than just access to Inks Lake. Many fine campsites, about 200, give you a choice of camping near the water or a short walk away. Mini cabins and primitive camping are also available. On our Dec. 12, 2006 trip to Inks Lake we took the Flying Scot and sailed completely around the 803 acre lake. Waterfowl abound, we saw blue herons, comorants, ducks, pelicans, and even an Egyptian Goose! Whitetail deer wander through the park all the time. Inks Lake is a good place to sail, the Inks Lake State Park has the only public boat ramp, but it is a good double ramp with good docks. The hills around the lake moderate the wind somewhat, but we had plenty of wind. 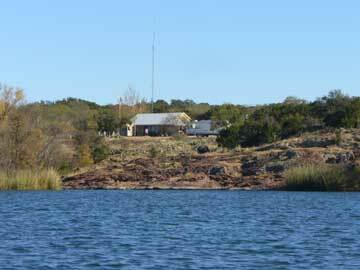 January, 2008: While Inks Lake State park has free wifi, they had only three antennaes. If you are "in the parking lot" of the entrance, the park store, or restroom #6 you can use the internet. It was faster than dialup, but not very fast. We were unable to use Outlook to check our email for some reason. We could not connect to the internet in any campsite. Phones: Sprint did not work in the park without roaming, but AT&T/Cingular worked well. 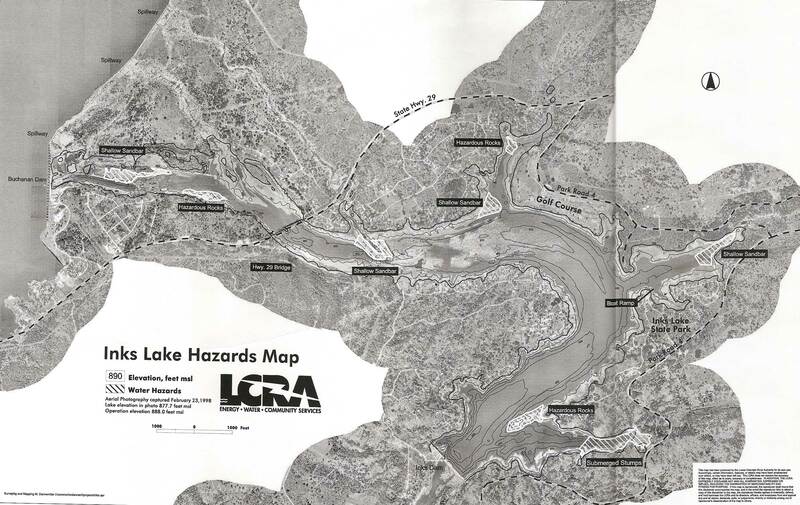 Keep in mind that you want to be near the Colorado river, on the east side, and follow the river to Inks Lake. Head for Llano or Burnet. From Llano on 29 east, a few miles after the 4 way stop at 1431, you will cross the new bridge over the Colorado, just below the Lake Buchanan dam. You will see the old bridge on the south, and the dam on the north. You will cross over the north end of Inks Lake on this bridge. About a mile past the bridge, turn right (south) on Park Road 4. Just a few miles to the park. From Burnet on 29 west, watch for the brown State Park sign and Park Road 4, less than 10 miles. Turn left on Park Road 4 and it's just a few miles to the park. If you come to the above mentioned bridge you missed it. From Marble Falls, go north on 281 a few miles and turn left on Park Road 4. Go past Longhorn Caverns, and a few miles after you pass 2342 you will come to the park. From Kingsland: Go east on 1431, after crossing the bridge stay in the left hand lane and turn left on 2342. You will come to a stop sign at Park Road 4, continue straight ahead onto Park Road 4 and in a few miles you are at the park. We ran aground several times on our sail. 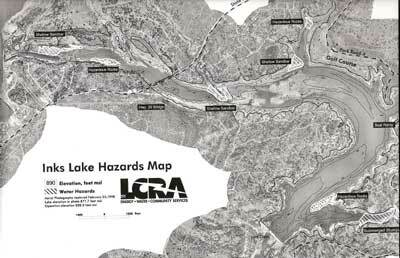 If we had had this map showing some of the hazards we would have faired better, but the hazards are not all marked! Click picture for larger image.